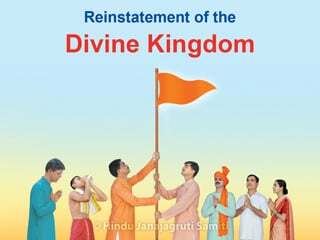 Home > Towards Establishment Of Hindu Rashtra > How to establish the Hindu Nation that has Dharma as its foundation? How to establish the Hindu Nation that has Dharma as its foundation? Who is the founder of the Hindu Nation ? 1. What is a ‘Hindu Nation’ ? 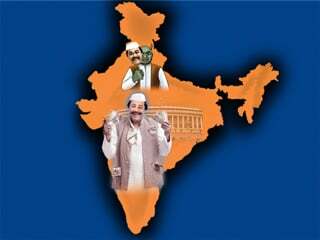 When we utter the term ‘Hindu Nation’, most people take the meaning as ‘Nation belonging to Hindus’. For that matter, some even take it as a concept put across to the people by a political party to gain political mileage; however, there is not a semblance of politics in the concept of the Hindu Nation. In fact, it is a well-established culture and a system helpful in leading day-to-day life. It will very much be a social arrangement which aims at spiritual evolution of human beings, animals, birds, insects, ants, trees and creepers to the subtlest of creatures. Since God has resolved to set up this arrangement, it can be termed a ‘Divine Kingdom’ as well. A society that is ready for any sacrifice and committed to the progress of the Nation, a duty-bound defence system, a legal system that stands by Truth, a system of governance that is productive and most important, the rulers who are loyal to Dharma, who are patriots and who strive selflessly day and night for the welfare of the society – these are going to be the distinctive marks of the Hindu Nation; and therefore, it is going to be an ideal Nation in the world ! There is Sanskrut adage, ‘द्रष्टा दृश्यवशात् बध्यते ।’ (The viewer is tied to the scene in front of him). Accordingly, because of the pollution caused by the present day system of governance that is secular, meaning ‘corrupt, selfish, caste-based and unpatriotic’, the supreme concept of ‘Hindu Nation’ has been eclipsed. The truth that ‘Ramrajya or Divine Kingdom is one where Hindu Nation has come into existence’ is being considered a myth. The ‘Hindavi Swarajya’, meaning, ‘Hindu Nation’ established by Chhatrapati Shivaji Maharaj has been deliberately pushed into oblivion and extreme efforts are being made to paint it ‘green’ under the pretext of terming it ‘secular’. Intentional efforts are being made to spread the belief that ‘Hindu Nation means religious fanaticism’; however, all this is false propaganda. Taking a clue from the Hindu Nations of the past, a prosperous Hindu Nation that will have a strong spiritual and cultural heritage is going to be established. This period is not distant. In the next 15-20 years, the Hindu Nation that will give a glimpse of the Divine Kingdom will be established. 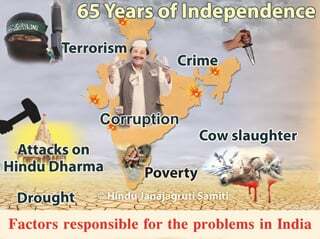 When there are no incidents that give a ray of hope of establishment of the Hindu Nation, speaking about the Hindu Nation will appear to many as an exaggeration; however, Saints who can look into the future have already sensed the bright tomorrow. 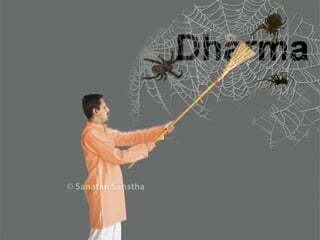 Making efforts in that direction is our sadhana (Spiritual practice) or duty unto Dharma. These days, it has become a fashion to eulogize (sing the praises of) a secular Government. One is forced to say that this praise they shower is due to the wrong notions about Dharma they have or their intellect getting tainted due to their anti-Dharma (unrighteous) behaviour. In modern terminology, what we term ‘Rashtrarachana (Organisational structure of the Nation)’ has been referred to as ‘Dharmasansthapana (Instating Dharma)’ in Sanskrut. Taking all aspects into consideration, Dharmasansthapana of this nature, meaning, establishing the Hindu Nation, is very much needed in the present circumstances. 2 A. From the perspective of difficulties faced by the Nation : Today, even after thousands of years, people remember ‘Ramrajya’; simply because it had Dharma as its foundation. As a result, the subjects then were cultured, happy and content. ‘During the reign of Shriram, grief, sorrow were unheard of’, this is how Maharshi Valmiki has described Ramrajya in the ‘Yuddhakand’ of Ramayan. We have a secular Government in Bharat today, and as a result, we find that sorrow, poverty and misdemeanours are on the rise everywhere. Instability arising out of terrorism, naxalism and crime, conversion of Hindus by other sects, destruction of temples and violence, step-motherly treatment to Hindus by the Government, impotency that Hindus have developed in the form of sarvadharma-samabhav (Equal regard for all religions) through overindulgence in Gandhian principles and the pollution caused by modern science – this is the true state of our Bharat. Since Hindus get no formal education on Dharma, they blindly follow western culture. The fact is, Hindus themselves are the cause of large scale harm to Hindu Dharma. The Divine language Sanskrut and the Sattva-predominant regional languages that have been derived from Sanskrut are on their death bed, and English is being heaped everywhere with undeserving praise. All this is a consequence of the ‘secular’ (meaning unrighteous) form of Bharat’s Government. It does not have the support of the Sattva-predominant Hindu Dharma. Hence, from the perspective of ending the problems faced by the Nation, establishing a form of governance that has Dharma as its foundation, has become the need of the hour. 2 B. Establishing the Hindu Nation is a necessity not just for the Hindus, but for entire mankind the world over : Establishing the Hindu Nation is a necessity not just for the Hindus, but for entire mankind the world over. 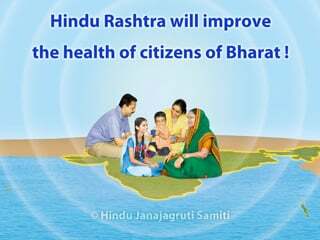 No doubt, Bharatiya citizens are going to benefit from the Hindu Nation (meaning the ideal Nation). Additionally, the fact that it is going to make the spread of Dharma throughout the world easy, the population around the world will learn about Spirituality and spiritual practice. This will help them in their spiritual evolution. It will generate a Sattva-predominant atmosphere in the world and entire mankind will become happy. 2 C. From the perspective of world peace : Sanatan Hindu Dharma teaches how to imbibe the highest values. It is a Dharma with indigenous tolerance. Therefore, it is benevolent for the world. To be able to continue living on earth, it is tolerance and not violence that is essential. That is why, the existence of Hindu Dharma is essential. Only if Hindu Dharma lasts, all will survive. There will be peace everywhere in the world and this noble aim will be achieved. 3. Who is the founder of the Hindu Nation ? 3 A. Nation-building is not the work of politicians : First and foremost, it should be firmly understood by us that it is impossible for the present day power hungry politicians to contribute to Nation-building; because Nation-building is a scientific process and only Truth can prevail there. While contemplating on this concept, the extent to which we accept defects such as falsehood and ignorance (knowingly or unknowingly), the structure will be weak and incomplete proportionately. Modern day politicians have a single agenda – to get and retain power. He who does not think of getting the power to rule the centre, can never be a politician in today’s context. There is a vast difference between Nation-building and such politics. Nation-building decides the place of the rule, purpose and limitations. 3 B 1. Importance of abiding by Dharma : Nation-building requires expansive analytical intellect to understand the prevailing circumstances and to work for the welfare of the Nation with foresight. Abiding by Dharma, meaning, performing spiritual practice helps in developing an analytical intellect; hence, devout Hindus should commence abiding by Dharma. 3 B 2. Only Hindus who abide by Dharma are true revolutionaries : Attracted towards moral (Spiritual) ideals, if a Hindu leads a moral (Spiritual) life, meaning, abides by Dharma, he is a revolutionary in the true sense. Only if leaders and their followers, who are interested in bringing about a revolution, are morally (Spiritually) inspired, they will be able to bring about a revolution. In short, if the modern revolutionaries are inspired to lead a life based on Dharma, then and only then, a Dharma-based revolution for the establishment of the Hindu Nation will be successful. 4 A. Education on Dharma : If Hindus are given education on Dharma, they will abide by Dharma. Abiding by Dharma will give them spiritual experiences. Spiritual experiences will enhance their faith in Dharma. This faith in Dharma will improve their pride in Dharma. The pride in Dharma will enhance unity among the Hindus. 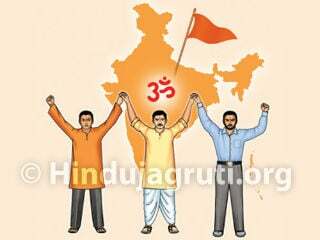 Unity among Hindus will generate security, and it is from here that the Hindu Nation will be created and nurtured. In nut shell, education on Dharma is the foundation for establishment of the Hindu Nation. 4 B. 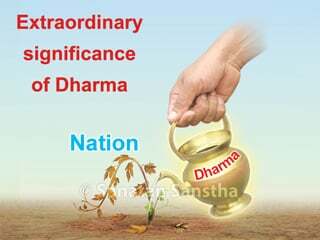 Awareness about Nation and Dharma : Harm is caused to Hindu Dharma and Nation through various mediums because Hindu society is not awakened and sensitive to such issues. So long as there is no awareness about the adverse conditions of the Nation and Dharma or the harm caused to them among Hindus, they will not be sensitive towards the needs of the Nation and Dharma. A society that is not sensitive towards the Nation and Dharma will not be able to contribute towards the establishment of the Hindu Nation. Therefore, we will have to undertake the mission of enlightening Hindu society very effectively. 4 C. Protection of the Nation and Dharma : An awakened Hindu society spontaneously protects the Nation and Dharma. Big-small Hindu organisations, which are loyal to Dharma, participate in the mission of protecting the Nation and Dharma at the physical level; whereas, intellectuals and Hindu Periodicals do the same at the thought level. This mission is not to be handled individually. If it is handled unitedly, it can become more effective. Various Hindu organisations can have different priorities. For example, cleaning of River Ganga, protecting cows etc. Unrighteous rulers are the fundamental reason for the harm that has been caused to the Nation and Dharma; hence, to protect the Nation and Dharma, entirely eliminating political parties that are traitors to the Nation and Dharma, should be our eventual aim. If this is achieved, there will not be any need to take care of all minute aspects, meaning, the difficulties associated with Hindu Dharma. 1. To bring about unity among the constituents of the society, winning its trust is important. Trust can be won only when we share their moments of happiness and sorrow, and help them. 2. Although we are supporters of Hindu Dharma, we continue to remain an integral part of the Hindu society. Therefore, it is our duty to do something constructive for this society; however, through whatever plans we implement for the society, we should ensure that through them, awareness about Dharma and protection of Hindus is affected. With the view to help the society, we can take up activities such as first-aid training, cleaning of temple premises, cleaning of villages, checking patients etc. Such activities will increasingly be complementary to Hindutva. When the actual revolution essential for establishing the Hindu Nation will commence, this society will transform into Hindu-power and support with determination. The projects meant for helping the society have so much importance ! You might be acrid or moderate, intellectuals or performers, you might have or not have knowledge of law, a day will certainly arrive when all of us will have to support this revolution; because the power-hungry politicians in Democracy will never hand over the charge of the Nation to us on their own. We will have to achieve it by way of a revolution. We will have to start a nationwide revolution at the appropriate time. ‘Kranti (Revolution)’ means having the emotion and desire to change for a better state. Kranti does not mean only bomb blasts or violence. It is the process of psychological change taking place at the same time in the society. Revolution is a fundamental human right. Bomb blasts are an attempt to revolt by one or two individuals, and it is against the Constitution; but when millions of people around the Nation come together to change for better, it is termed a ‘National revolution’ (from the Nation’s perspective). We have to generate this kind of atmosphere of change all over the country. 5 A. Dharmakranti is not a mere revolution, it is an evolution (Utkranti) : Revolution is like a gale storm that completely destroys everything, meaning, old values, old attitudes, old organisations and old establishments. Instead of creation there is more destruction. We do not expect this kind of revolution. It is quite evident from history and traditions of Bharat, that our sentiments are appropriate for evolution rather than for revolution, renaissance rather than living in accordance with it. Revolution and evolution, renaissance and life have a basic difference. Evolution and renaissance depend on life. They do not destroy life or anything else, but let it survive. 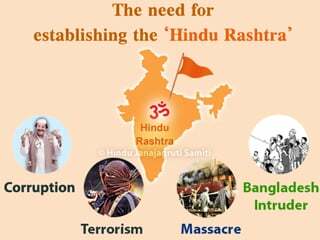 While working for the establishment of the Hindu Nation, leaders of Hindu organisations and their volunteers should pronounce aloud, ‘Hindu Nation is my birth right and I shall have it !’ We cannot afford to stop thinking that no one is with us to establish the Hindu Nation. We have to put in as much effort as is possible. For this, we have to remember 2 lines of a poem written by Rabindranath Thakur, which say, ‘If no one responds to your call, go ahead on your own’. 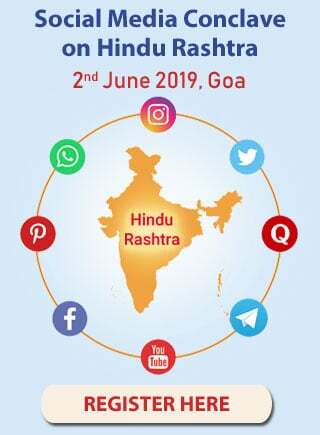 That the Hindu Nation will be established is an undisputed fact as per the times, and organisations like Sanatan Sanstha are taking care of the fight at the spiritual level essential for achieving this goal. All said and done, this historical mission is going to be accomplished through the medium of Hindu organisations only. To make our medium stronger, all of us will have to work for it. Let the golden page in the annals of history of the establishment of the Hindu Nation based on Dharma be written through the medium of this convention; this is a prayer unto the Holy feet of Shrikrushna !